Are You Capable Of Supernatural? 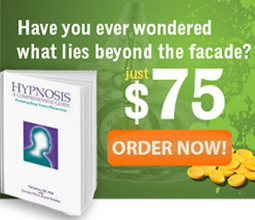 About The Tad James Co.
Home » NLP Coaching » Are You Capable Of Supernatural? From the perspective of quantum physics the observer is one with the observed. More like-minded scientists are coming to the realization that we are the cause of many of our own experiences including that we create our own life events. Most people when they hear something as outrageous as the previous statement react with dismay and even anger especially if they have just gone through some painful or hurtful event. So, chill out, nobody says that you created a painful event for yourself consciously and with will. But what if, all your beliefs and decisions and thoughts and emotions are manipulated and made to have you experience something and you don’t even know? There are a host of phenomena that we all experience but dismiss as pure happenstance. The familiar impression that you have been before in a place even if you clearly know you went there for the first time? Or that you know what’s about to happen or maybe even something does happen and it seems like it was meant to be? These are all too common experiences and yet, our modern materialistic god of science tells us that this is pure coincidence and there is nothing to it. Of course, in the background, the “special studies” never published or made known through main stream media are all but full of experiments on remote viewing, telepathy, telekinesis, changing of reality with the power of the mind and similar “out of ordinary” phenomena. Déjà vu, Precognition, ESP, Synchronicity are just a few experiences that should be available to all humans were not our minds be limited by the repeated mantra that the mind is only in the brain, and that there is nothing more to a human being than molecules and atoms, chemicals and electro-magnetism. In other words that you are a biological machine and nothing else. These phenomena are not “supernatural” at all – they are part of your makeup. But the orthodox science, because there is apparently no “logical” explanation in Newtonian physics for all these phenomena, refutes them completely and all of those who dare bring them to public’s scrutiny are chastised and made into lunatics. Why is it that when we put a goal in the future Time Line as in Creating Your Future® Coaching Techniques and we do the process in a certain way following a certain procedure which involves the tool called “your mind” we are always and without exception likely to get exactly what we want and when we want it? Do we modify the future with our minds? Is the future really “out there” or is it here and we create it based on our moment to moment choices – choices made WITH OUR MINDS? The answer is obviously yes, but why is this not well known as a practice everyone could do? Why is it not taught in our schools and universities? Why is it not a common routine of every business owner? Why is thinking so detested and despised nowadays, and why is it replaced by feelings alone? What’s going on? Had science had the answer for a long time? And if these kinds of occurrences happen all the time to so many of us then how could we still be calling it ‘supernatural’? If it was taught to everyone and we all could do it, it would be natural right? In fact the phenomena of quantum entanglement shows exactly that possibility. But how many people understand what quantum entanglement really means? Theoretical physicist John Archibald Wheeler had some very interesting conceptual writing on reverse causation or “retro-causality” in his updated double slit experiment, aka “delayed choice.” To put it simple he was thinking of the fact that thought is one of the things that bypasses the space-time dimension completely as if it wasn’t there. This means instant faster than the speed of light communication – including the future. He believed that the future can affect the past. Any doubts about it? Try to put a goal in the future Time Line, do it correctly, run the certainty frame on it and let go of the doubts and see what’s happening! After that, you won’t have any doubts that your future memories affect you today (which is the past as you look at it from the future perspective). Download the Free NLP Info Pack and take the first steps in becoming great by improving your life and the lives of others! 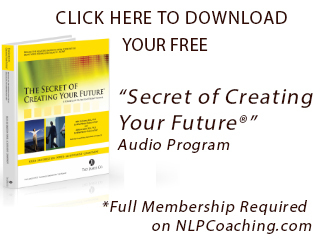 When you become a member of NLP Coaching, you get exclusive access to member content, free audios and more. Plus, for the cost of one, you will receive 5 memberships!